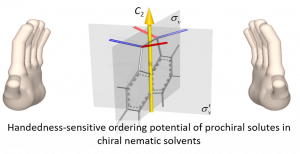 ABSTRACT: We have developed a molecular theory for enantiotopic discrimination in prochiral solutes dissolved in chiral nematic solvents by means of NM R spectroscopy. The leading rank tensor contributions to the proposed potential of mean torque include symmetric as well as antisymmetric terms with respect to spatial inversion; these lead to consistent determination of all prochiral solute symmetries for which enantiotopes are distinguishable by NMR and also to excellent quantitative agreement when tested against the available experimental data for the rigid solutes acenaphthene and norbornene as well as for the moderately flexible ethanol molecule. We study theoretically the molecular origins of the fascinating, and still debated, nematic–nematic phase transition exhibited by symmetric, statistically achiral, mesogenic dimers. A simple molecular model that mimics the key features and symmetry (C2V) of this class of mesogens is presented. In the mean-field approximation, the model yields up to three positionally disordered phases, one isotropic and two nematic. The low temperature nematic phase (NX) has a local two-fold symmetry axis, which is also a direction of molecular polar ordering and is tightly twisted about a macroscopic phase axis. 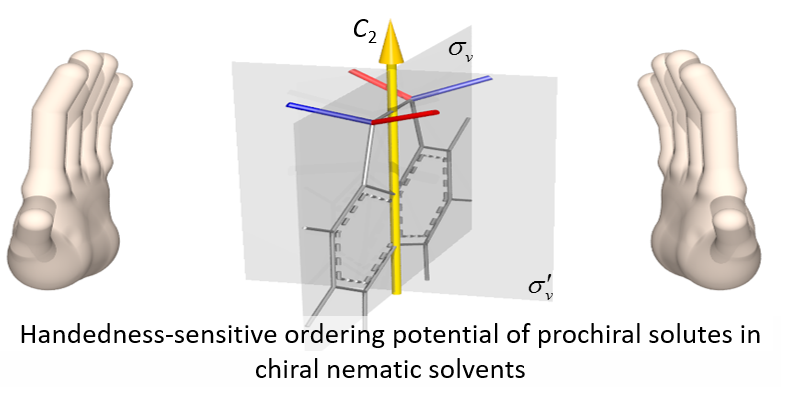 The onset of polar ordering generates spontaneous chiral symmetry breaking and the formation of chiral domains of opposite handedness, manifested primarily by the twisting of the polar director. Within these domains the statistical balance between the enantiomer conformations is slightly shifted and the principal axes of the ordering tensors of the molecular segments twist at constant tilt angles with the helical axis. 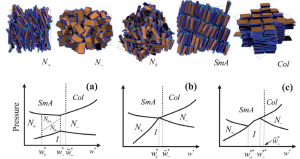 Key experimental results on the NX phase of liquid crystalline dimers are discussed in the light of the theoretical predictions of the model, which are also contrasted with the predictions of the twist-bend nematic model. Abstract: NMR measurements on a s electively deuterated liquid crystal dimer CB-C9-CB, exhibiting two nematic phases, show that the molecules in the lower temperature nematic phase, NX, experience a chiral environment and are ordered about a uniformly oriented director throughout the macroscopic sample. The results are contrasted with previous interpretations that suggested a twist-bend spatial variation of the director. A structural picture is proposed wherein the molecules are packed into highly correlated chiral assemblies. Abstract: The surface alignment of liquid crystalline dendrimers (LCDrs) is a key factor for many of their potential applications. Here, we present results from Monte Carlo simulations of LCDrs adsorbed on flat, impenetrable aligning substrates. A tractable coarse-grained force field for the inter-dendritic and the dendrimer-substrate interactions is introduced. 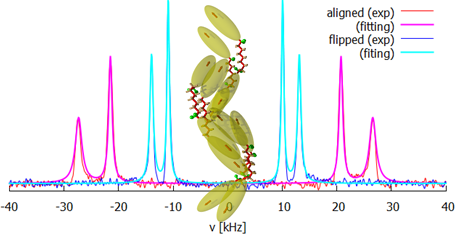 We investigate the conformational and ordering properties of single, end-functionalized LCDrs under homeotropic, random (or degenerate) planar and unidirectional planar aligning substrates. Depending on the anchoring constrains to the mesogenic units of the LCDr and on temperature, a variety of stable ordered LCDr states, differing in their topology, are observed and analyzed. The influence of the dendritic generation and core functionality on the surface-induced ordering of the LCDrs are examined. Anke Hoffmann, Alexandros G. Vanakaras, Alexandra Kohlmeier, Georg H. Mehl, Demetri J. Photinos, arXiv:1401.5445 [cond-Mat]. (2014). http://arxiv.org/abs/1401.5445. 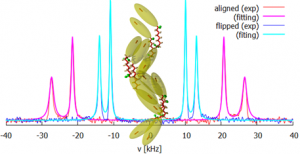 Abstract: NMR measurements on a selectively deuteriated liquid crystal dimer CB-C9-CB exhibiting two nematic phases show that the molecules in the lower temperature nematic phase, Nx, experience a chiral environment and are ordered about a unique direction. The results are contrasted with previous reports that proposed a twist-bend spatial variation of the director. A structural model is proposed wherein the molecules show organization into highly correlated assemblies of opposite chirality. Stavros D. Peroukidis, Alexandros G. Vanakaras, S. D. Peroukidis, A G. Vanakaras, Soft Mater, 9, 7419-7423 (2013). DOI: 10.1039/C3SM51165K. The rich mesophase polymorhism and the phase sequence of board-like colloids depends critically on their shape anisometry. Implementing extensive Monte Carlo simulations, we calculated the full phase diagram of sterically interacting board-like particles, for a range of experimentally accessible molecular dimensions/anisometries of colloids of this shape. A variety of self organized mesophases including uniaxial and biaxial nematics, smectic, cubatic and columnar phases have been identified. Our results demonstrate clearly that the molecular anisometry influences critically not only the structure and the symmetry of the mesophases but also, and perhaps more interestingly, the phase sequence among them. New classes of phase sequences such as nematic-nematic and, for the first time, a direct transition from a discotic and a biaxial nematic to an orthogonal smectic A phase have been identified. The molecular geometry requirements for such a phase behavior have been located. The purpose of this biennial conference is to bring together the research community working in the interdisciplinary field of Liquid Crystals and soft anisotropic materials. The conference will be held from September 22-27, 2013 in the Paradise Mare Hotel, a five star resort, in Rhodes, Greece. V. Yannopapas, N. Fyttas, V. Kyrimi, E. Kallos, A.G. Vanakaras, D.J. Photinos, PSSA, DOI: 10.1002/pssa.201228489. We study the optical properties of gold nanoparticles (NPs) coated with a nematic liquid crystal (NLC) whose director field is distributed around the NP according to the anchoring conditions at the surface of the NP. The distribution of the NLC is obtained by minimization of the corresponding Frank free-energy functional whilst the optical response is calculated by the discrete-dipole approximation (DDA). We find, in particular, that the anisotropy of the NLC coating does not affect much the (isotropic) optical response of the NP. However, for strong anchoring of the NLC molecules on the surface of NP, the inhomogeneity of the coating which is manifested by a ring-type singularity (disclination or Saturn ring), produces an enhancement of the extinction cross spectrum over the entire visible spectrum. V. Yannopapas and A. G. Vanakaras, Phys. Rev. B, 84, 085119 (2011).